We love anything that falls into both the breakfast and dessert category. 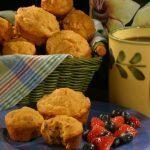 That’s why these sweet potato muffins are so great: you can enjoy them for either! Chock full of sweet tater and banana goodness, so you can be sure our Sweet Potato Banana Muffins are creamier and more flavorful than your average muffin. And what better way to rescue over-ripe bananas and leftover baked sweet potatoes than to transform them into delicious muffins? Talk about a makeover for the books. Best enjoyed warm, with a hot cup of tea, and in the company of friends and family. Preheat oven to 400 F. Grease 2 dozen 2-inch muffin pans. In medium bowl, combine flour, sugar, baking powder, allspice and salt. In large bowl, combine sweet potatoes, bananas, butter, eggs and milk; mix well. Add flour mixture and pecans; mix well. Fill prepared muffins pans two-thirds full. Bake until tops spring back when lightly touched, about 20 minutes. Serve warm.